John Debney has been a composing favorite for many years. His diverse scores ranging from Cutthroat Island to Aliens In the Attic have always held his lighthearted writing. In 1999, Debney tackled the perfect genre suited for him; comedy. Liar Liar seemed like the perfect vehicle for his style of writing. Fortunately, Debney performed perfectly with this score. The fluffy main theme opens up the album in 'My Dad's A Liar'. Throughout the score, Debney samples the theme numerous times throughout the score, occasionally as a softer lullaby or even in a crazy madcap style. There are also several bouncy and cartoonish moments in the score. The best example of this is 'Bathroom Folly'. The highlights of the album, however, come at the more emotional moments. 'Im a Bad Father' and 'Together' introduce a surprisingly emotional theme. This is where Debney really shows his best. 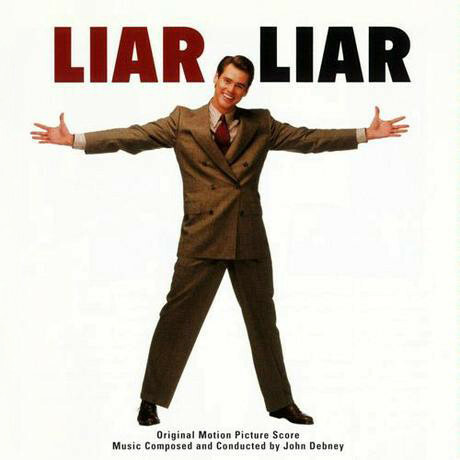 John Debney really hit a good mark when he scored Liar Liar. The music remains fun and bouncy throughout without ever becoming boring. My one complaint, however, lies with the album itself. Released around a time when score albums were short, it's understandable that the running time is short, but 29 minutes is ridiculous. Alot of great cues from the film were ommitted. Not too mention the price of the album for such a small amount of music. Otherwise, I would recommend this score to anyone who wants to hear a comedy score that isn't too bland.